Today I’m sharing something really special for coffee lovers. When I was a kid, I never wanted to eat coffee cake because I thought it was actually flavored like coffee, and I hated the stuff. 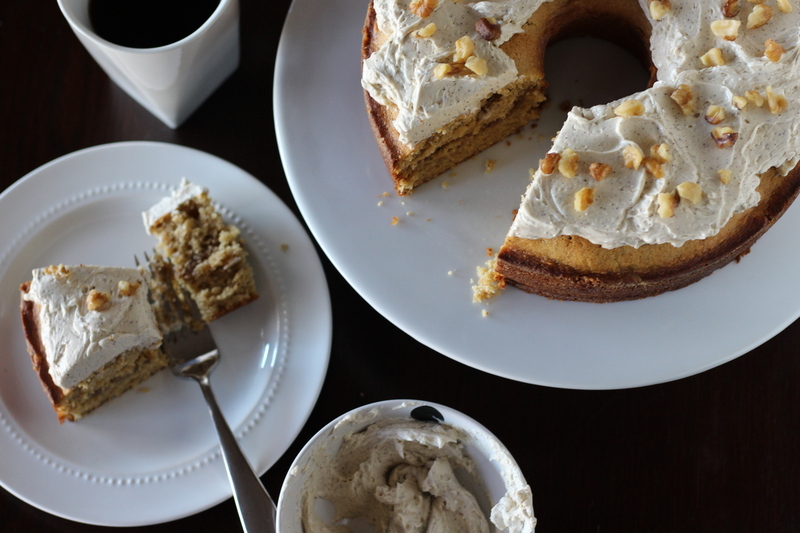 As a now coffee-loving-adult, I’m actually kind of bitter about the fact that coffee cake doesn’t actually taste like coffee at all. I mean don’t get me wrong, coffee cake is still yummy. But why not make it taste like an actual cup of some fantastic real stuff? I’m talking truth right now, and all you coffee lovers out there know it. 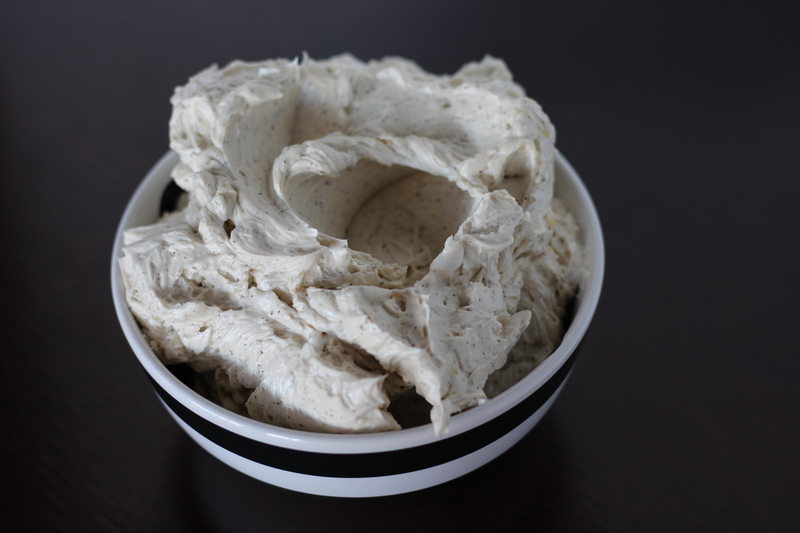 So today I’m sharing the recipe you’ve always wanted. I’m calling it a Cappuccino Coffee Cake, and if you haven’t already scrolled down to the ingredients to go shopping, I won’t blame you for skipping the rest. 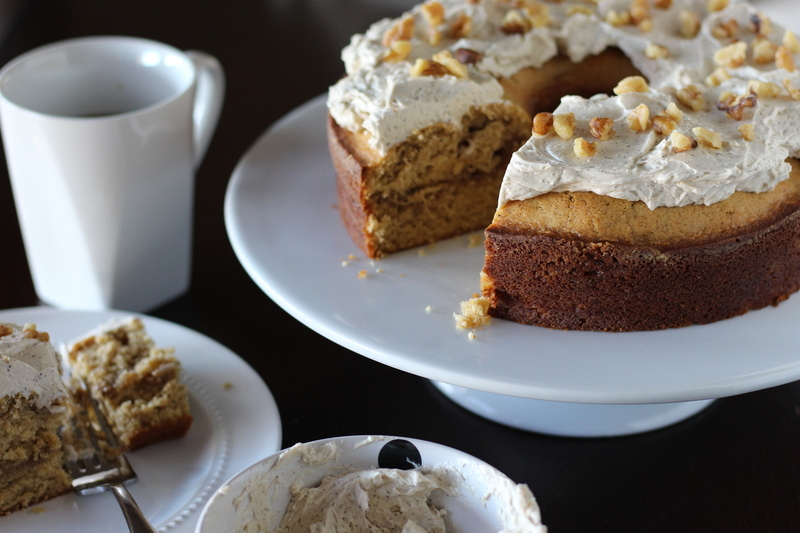 This is a super moist and tender cake with coffee baked right in. 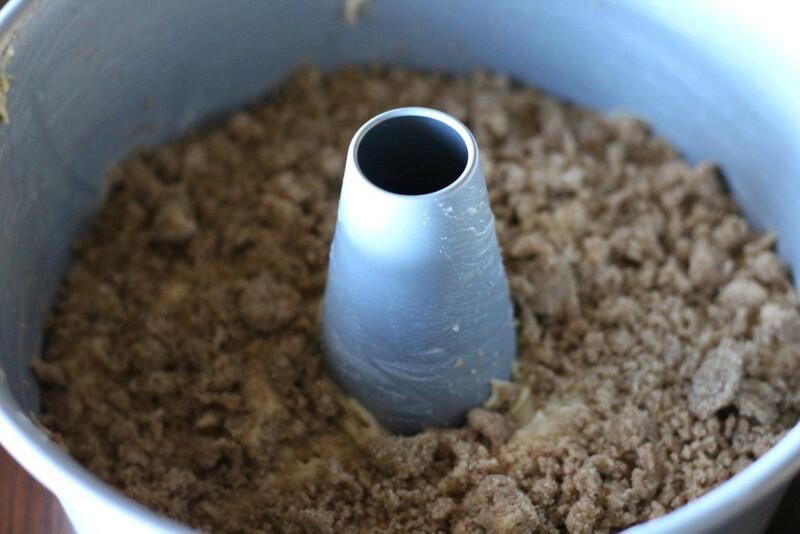 I’ve kept our traditional center streusel for the cake, along with lots of warm cinnamon and vanilla flavors. 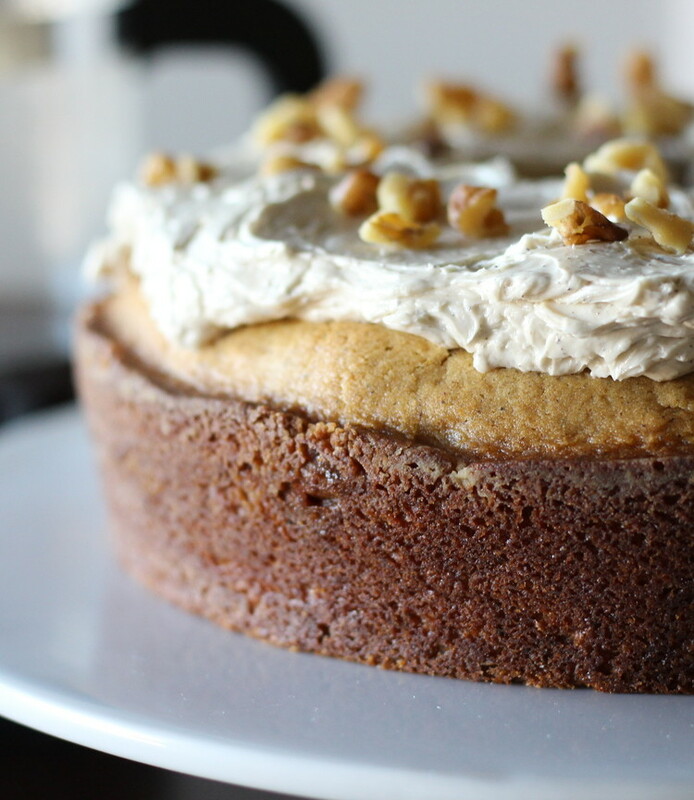 Lastly, it’s topped with the most divine, fluffy, coffee cream frosting. 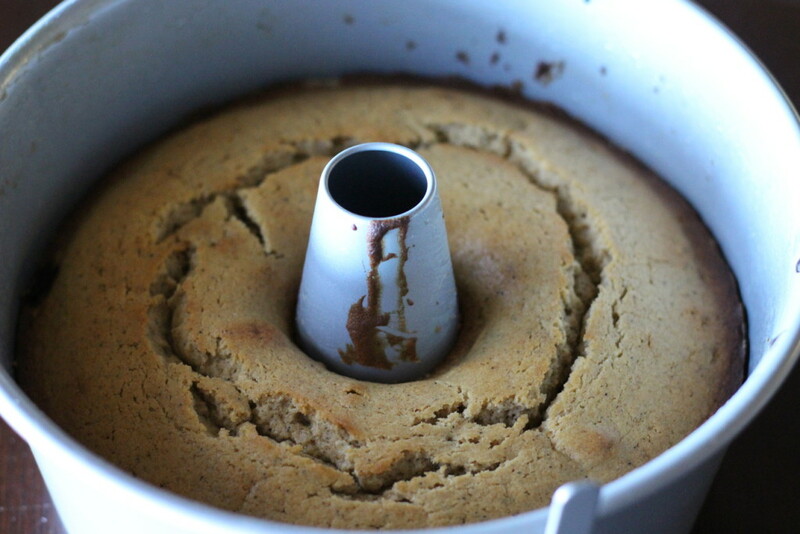 Keep in mind, overall this isn’t your typical sticky sweet cake. 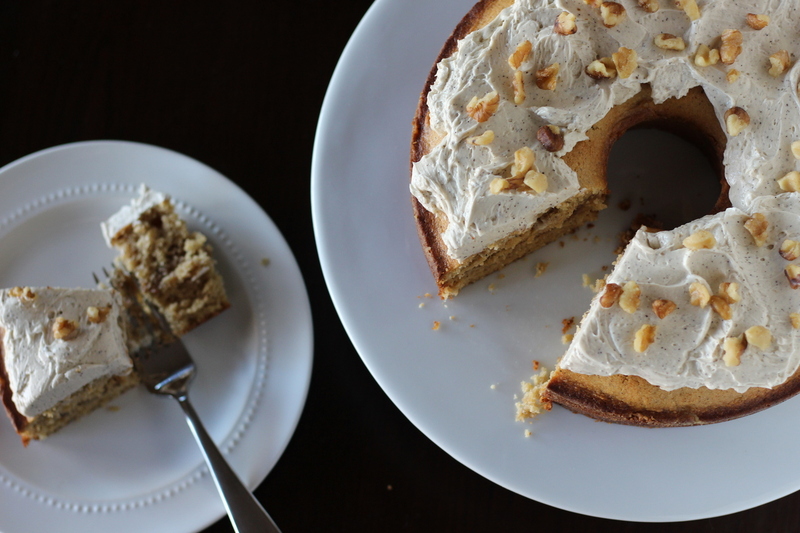 It’s got streusel and frosting, but everything is cut by strong, bitter coffee flavors throughout. That being said, I’m not a black coffee drinker, so I was really looking for a balance of sweet to bitter for this cake. If you’re looking for a perfect afternoon coffee pairing, this is it, you’ve found your match. Make it, love it, tell me all about it! In a small saucepan, heat the buttermilk, vanilla, and ground coffee on low-medium heat, and let coffee steep for 10 minutes. Strain the mixture through a fine mesh strained to remove the larger granules of coffee, set aside to cool completely. Preheat your oven to 375 degrees, and grease a tube pan thoroughly. In a large bowl, beat together the butter and sugar until fluffy. Add in the eggs and beat until fully incorporated. Add the flour mixture and the cooled coffee buttermilk mixture in alternating additions, and beat for another minute until the batter is smooth. Mix all ingredients together with a fork or your hands until the mixture is crumbly with lumps the size of peas. 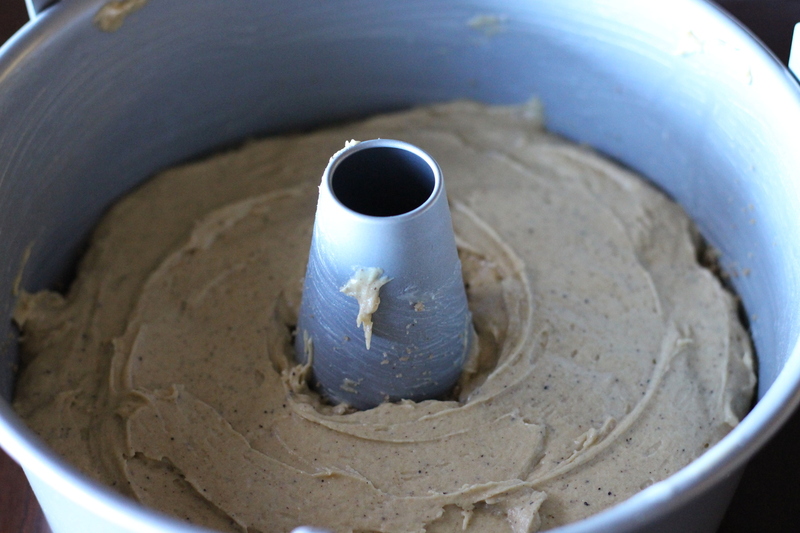 Pour half the cake batter into your prepared pan, and spread evenly. Then sprinkle the entire streusel mixture evenly over the cake batter. Pour the remaining batter over the top, and smooth out to cover the streusel middle. Bake at 375 degrees for 35-40 minutes, or until a cake tester comes out clean. Cool cake completely before removing from the pan. Beat your softened butter and the powdered sugar until smooth. Add in the coffee and espresso powder and beat until incorporated. Then add the heavy cream and beat until you've got a fluffy, light frosting. Add a little more sugar if you need to. Spread over the top of your cooled cake, and sprinkle with walnuts if you'd like! Hello and welcome! My name is Nicole, and Dough-eyed is a food blog for people who want to bake for their family and friends in high-altitude areas. Think of me as a friendly voice there with you in the kitchen, here to give you confidence when you're baking, and to help you with the struggles of baking at high-altitude. Come back every week for new recipes, tips, and advice on high-altitude baking! Get your copy of Sugar High, and get baking in your high-altitude kitchen! never miss a recipe- sign up for email updates here!